Espresso? Latte? Caffe Corretto? What Should I Order in the Bar in Italy? Most Italians stop at the bar on their way to work in the morning, for a quick coffee and often a cornetto, or croissant. They may stop several times a day for more coffee, and you should, too. Coffee at the bar in Italy is an integral part of the culture–if you have a meeting or linger for small talk with an Italian friend, he or she may well ask, "Prendiamo un caffè?" (Let's get a coffee?) regardless of the time of day. Plus, Italy makes some of the finest coffee in the world, so you simply must try some while you're here! 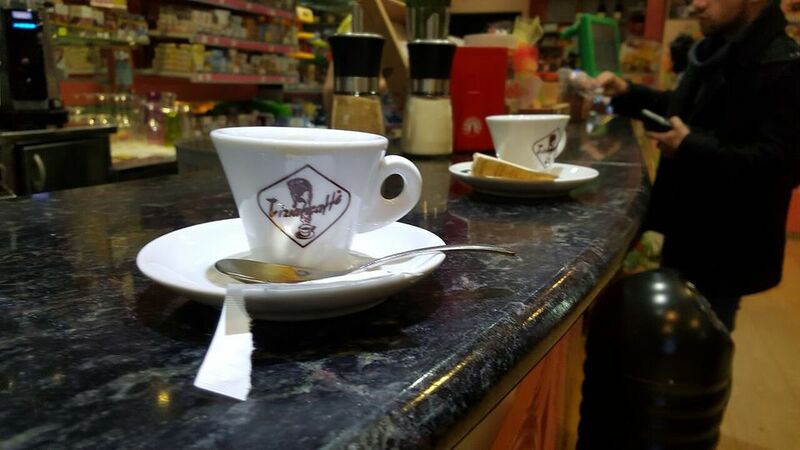 Here are some of the most popular coffee drinks served in an Italian bar. Caffè (kah-FE) - We might call it espresso; a tiny cup of very strong coffee, topped with a caramel-colored foam called crema, a very important element in the best examples. Caffè Hag is a decaffeinated version. You can order a decaffeinato as well; Hag is the name of the largest producer of Italian decaf coffee and that's the way you'll see it on many bar menu boards. You'll sometimes hear Italians call this "dek"–short for decaf. You can order a straight coffee (un caffè) any time of night or day. Italians stay away from cappuccino after about 11 AM, as it's made with milk and milk is considered a morning-only drink. If you see a bunch of people sitting around drinking cappuccini at three in the afternoon, congratulations, you've found the tourist bar. Caffè lungo (Kah-FE LOON-go) - a long coffee. Still served in a small cup, this is espresso with a little more water added, perfect if you want more than one sip of coffee. Caffè Americano or American Coffee, may be presented to you two ways: a shot of espresso in a regular coffee cup, served with a little pitcher of hot water so you can dilute your coffee as much or as little as you wish, or just a plain ol' cup of coffee. Caffè ristretto (kah-FE ri-STRE-to) - a "restricted coffee" or one in which the stream of coffee is stopped before the normal amount. It's the essence of coffee, concentrated but should not be bitter. Caffè con zucchero (ZU-kero) - espresso with sugar. Usually, you'll add your own from a packet or container at the bar, but in some places, especially in the south around Naples, the coffee comes with sugar and you have to order it senza zucchero or without sugar, if you don't like it sweet. Caffè corretto (kah-FE ko-RE-to) - coffee "corrected" with a drizzle of liquor, usually Sambuca or grappa. Caffè macchiato (kah-FE mahk-YAH-to) - coffee "stained" with milk, usually just a bit of foam on top of the espresso. Caffè latte (kah-FE LAH-te) - Espresso with hot milk, or a cappuccino without the foam, often served in a glass. This is what you might call a "latte" in the US. But don't ask for a "latte" at a bar in Italy, as you're likely to be served a glass of hot or cold milk–latte in Italian means milk. Latte macchiato (Lah-te mahk-YAH-to) - Steamed milk "stained" with espresso, served in a glass. Cappuccino (pronounced kah-pu-CHEE-no) - a shot of espresso in a large(er) cup with steamed milk and foam. While many tourists will finish their lunch or evening meals with a cappuccino, this drink is not ordered by Italians after 11 in the morning. Most bars and restaurants will serve it to you anytime you ask, though. Bicerìn (pronounced BI-che-rin) - A traditional drink of Piemonte around Torino, consisting of dense hot cocoa, espresso, and cream, artfully layered in a small glass. Not usually found outside of the Piemonte region. Caffè freddo (kah-FE FRAYD-o) - Iced, or at least cold, coffee, very popular in summer but may not be found at other times of the year. Caffè Shakerato (kah-FE shake-er-Ah-to ) - In its simplest form, a caffè shakerato is made by combining freshly made espresso, a bit of sugar, and lots of ice, and shaking the whole deal vigorously until a froth forms when poured. It may have chocolate syrup added. Caffè della casa or house coffee - Some bars have a specialty coffee drink. The caffè della casa at Caffe delle Carrozze in Chiavari is one of the best. One thing to remember when you go to the bar, you'll often pay more to sit down than to stand at the bar. Want to know exactly what an Italian bar is? What Is an Italian Caffe Shakerato and How Do You Make One? What Is a Piazza and Where Are the Best Ones to See in Italy?